Even though I see it happen every single year, it always surprises me to see how fast things grow and change in the garden at this time of year. This is also the time of year we typically experience a change in the weather from cool, moist spring to hotter summer temps. That tends to push our summer veggies into overdrive of growth and our spring veggies to finish up. I think the theme of this week’s post is Growing Like Crazy vs Done and Almost Done. The tomatoes are growing like weeds. An interesting observation currently is that the non-grafted plants may be slightly ahead of the grafted in flowering. The grafted plants are putting on a lot more vigorous sucker growth. Many trials have found that grafted plants may tend to fruit slightly later and have more foliage, so what we are seeing would seem to track with those results. The ‘Peas-in-a-Pot’ that were covered in pea pods a week ago are now bare of flowers and pods. They are not bare of powdery mildew however. The yellowing and disease, coupled with the lack of production is a really good indicator that this variety has run its course and it is time to remove it. It will soon be too hot for the plants and it is done producing. Back on the growing fast side of the equation, the cantaloupes, watermelons, cucumbers, and other melons that we have planted have germinated and are growing well. They seem small right now, but I can guarantee you that they will double, triple, or quadruple in size over the next week or two. In contrast, the garlic is quickly approaching the end of its growing life. Typically it should be harvested and cured when about 5 leaves have died. As you can see, this variety is going to be ready to harvest soon. This last picture is in the “FINALLY” category. We had planned to plant Aji Amarillo peppers in the Peruvian Garden, because they are the most popular pepper in Peruvian cuisine. However, the seeds we ordered never germinated, despite being planted twice. We finally gave in and ordered seeds from another source and planted them last week. Happily, we have gotten several seedlings from this batch. So this variety will be late in the garden, but hopefully we will get something. While we are planning on growing a wide variety of peppers in most of Bed 1, we have the two square tiers that are also part of Bed 1. We chose to plant lettuce in those beds for the spring, followed by cover crops, followed by a fall planting of garlic. However, we aren’t just planting lettuce in rows this spring. We wanted to change it up and show how you might use lettuce to be part of an edible landscape in place of other ornamentals. What do those look like? If you said quilt blocks, you would be right! I found the idea in some youth gardening materials and thought it would be a fun way to arrange some of our usual spring salad gardens rather than the straight rows. We are trying a couple new (to us) varieties of oak leaf lettuce, ‘Mascara’ and ‘Encino.’ The other lettuces are leaf and romaine lettuces that we grew last year. The two garlic varieties are a couple that I thought looked interesting, but we will see what is available when the time to order garlic arrives this summer. Eggplant is my new favorite vegetable. The wonderful varieties growing in the demo garden have convinced me not to overlook this vegetable any more!. My favorite ones to cook with are the asian and varigated colored ones. You have to give them a try, I think you will be pleasantly suprised by how good they really are! 2. Preheat oven to 4250 F.
until tender, about 2-3 minutes. 4. Add garlic and cook for 1 minute. Add chopped tomatoes, basil and oregano. Cook gently over medium low heat for 10 minutes. 5. Spread half of the mixture over the bottom of an 8 x 8” baking dish sprayed with non-stick cooking spray. 6. Add half of the eggplant slices then half of the tomato slices. Sprinkle half of the mozzarella cheese over the top. 430 mg sodium vitamins C and A. 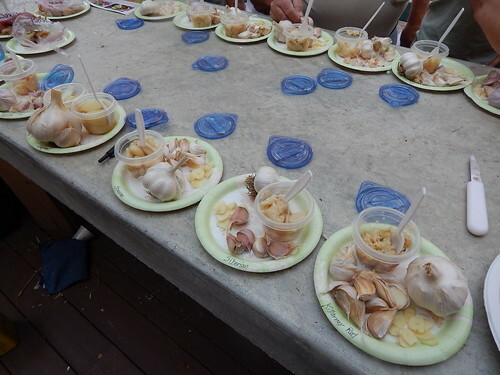 We wrapped up our “Year of Garlic” in the Demo Garden this morning with a tasting of all the different varieties and a chance to observe the size of the cloves, the number of cloves, and the size of the bulbs. I had also made some observations earlier to record. I roasted two heads of each variety of garlic, which we then tried on pieces of French bread. (I roasted the garlic by separating the cloves, trimming off the bottom of each, then tossing them in olive oil and wrapping them in foil packets. I roasted them in the oven for 45 minutes at 350. This method was supposed to be less mess than roasting a whole head and squeezing it out. Not so much, at least for some of the varieties. Here are my final thoughts and comments on all the different varieties. (Any recommendations are still cautionary, because we only tried them in our garden situation and only this year. There may be different results in different years or in different locations.) If you want to get a look at pictures of all the varieties, go here. Maiskij – This was the earliest variety that was very healthy and impressive all along. The bulbs were huge and the cloves were medium-large, with about 15 cloves per head. Music – This variety was later to mature, but was also very healthy all along. The bulbs were very large and the cloves were also large to very large. There were only 9 cloves on the head I opened, but they were all big and peeled easily. Purple Glazer – This variety was donated to the trial by one of our Master Gardeners than grows it every year. It was a winner! The bulbs weren’t as big as the other two, but they were nice sized and the cloves were large to very large. There were 9-10 cloves per head again here. Ajo Rojo – This garlic was also earlier maturing with large bulbs. It only had medium to large cloves, with 12 cloves per bulb. I really like this variety, but I didn’t feel like it held up as well to storage as some of the others. Chesnok Red – Another variety with nice sized bulbs and cloves. The cloves were large with 9-10 per bulb. I’m not sure why this one is not in the “Top Performers” category. I think I just generally felt the plants weren’t quite as vigorous and the bulbs weren’t quite as uniformly nice. Still a really nice variety. Killarney Red – This variety had nice sized bulbs, large cloves, 12 cloves per bulb and was very similar to Music and Chesnok Red. Main reason it is in this group is that I felt like the survival rate might not have been quite as good after planting, and I threw away half a dozen bulbs when I took them down last week. Still, I know this variety wasn’t quite as dry when we harvested it, so I would want to try it again before calling it a definite bust. Sonoran – This variety just never stood out. I don’t remember anything particularly great about it or anything bad. It had nice sized but slightly smaller bulbs, the cloves were medium sized, and there were 10 cloves per bulb. Inchelium Red – This is one of the softnecks, and I guess I rated it here just because I don’t like it. It had large bulbs, but with 15 cloves per bulb, the cloves were a little smaller. This is supposed to be the middle of the road mild flavored garlic. Maybe that’s why I call it mediocre? Persian Star – I originally put Persian Star in the “Poor” category, but upgraded it after further consideration. The bulbs were medium sized, the cloves were medium sized, and there were 10 cloves per bulb. This one also lost several bulbs in storage, so I guess that’s why I thought it deserved another chance. That and it is such a beautiful purple! S & H Silver – This is the other softneck and probably the most similar to what you would find in the grocery store. The bulbs were fairly small and the cloves were small and numerous (18 per bulb). I really dislike small cloves, so for me this is not a great variety. Still, it did relatively well and I can see that some people might want to plant it. Ferganskij – This variety had poor germination and growth last fall, which continued all season. The bulbs, not surprisingly were small. The cloves were medium sized, with 12 cloves per head. There seemed to be many better choices. Siberian – This variety was probably the poorest performer of all of them, with poor germination, poor growth, small plants, and small bulbs. Surprisingly, the cloves were large, and there were 8-9 cloves per bulb. We also lost some in storage. The final bulbs were pretty nice, there were just only a few of them by the time it was all said and done! 1. Wash hands and work area. oil and Parmesan cheese. Process until smooth. mixture in the bowl. Top with sun-dried tomato paste and spinach mixture. onto a medium serving dish to serve. Refrigerate leftovers immediately. Serve this yummy, zingy dip with crackers or bread at your next party. It’s best when chilled overnight before serving.